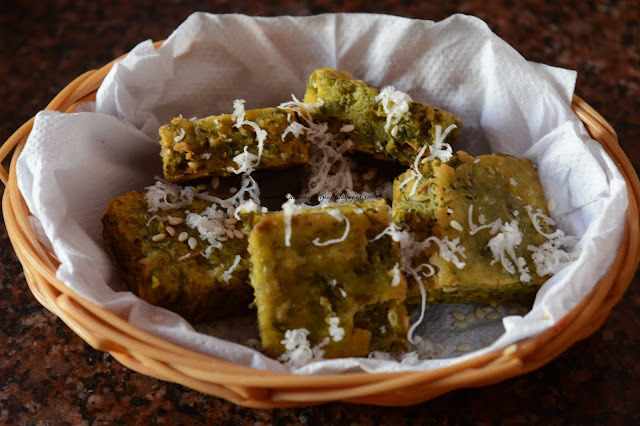 Neveri or Goan Nevri is originally a Goan Recipe widespread in Maharashtra due to its amazing taste. This is a steamed variant of otherwise fried karanji, thus healthier. Made with the heavenly combination of grated coconut and jaggery, this Nevri Recipe is luscious. This coconut filling stuffed in the rice flour covering when steamed to perfection, makes the Nevri moist and juicy. This delicious sweet dish comes with the goodness of coconut and flavor of jaggery. This tasty, quick and easy to make Neveri is a must try during this festive season. To Make a stuffing take 2 cups of scrape coconut and 1&1/2 cup of jaggery. Heat this mixture on medium low heat. Add cardamom powder and mix it. Stir it Continuously to avoid burning. Turn the heat off once the mixture is thick. To make a cover boil 2 cups of water, add pinch of salt and little oil. Once water starts boiling turn the heat on low add rice flour and stir it. Cover and let the steam trap inside to cook the dough. After 2 minutes remove it from heat. Put the dough in plat knead it when it is hot. If required add little warm water and oil. Divide it into equal small balls. Put 1 tbsp coconut mixture in the center of disc and fold other half area. Join the edge and seal. Prepare all like this. Steam into a pressure cooker do not put whistle. 1) To Make a stuffing take 2 cups of scrape coconut and 1&1/2 cup of jaggery. 2) Heat this mixture on medium low heat. Add cardamom powder and mix it. 3) Stir it Continuously to avoid burning. Turn the heat off once the mixture is thick. 1) To make a cover boil 2 cups of water, add pinch of salt and little oil. 2) Once water starts boiling turn the heat on low add rice flour and stir it. 3) Cover and let the steam trap inside to cook the dough. After 2 minutes remove it from heat. 4) Put the dough in plat knead it when it is hot. If required add little warm water and oil. Divide it into equal small balls. 1) Take one ball press it and spread evenly with your hand make a disc(Pari). Put 1 tbsp coconut mixture in the center of disc and fold other half area. 2) Join the edge and seal. Prepare all like this. 3) Steam into a steamer. 5) It’s ready to eat.